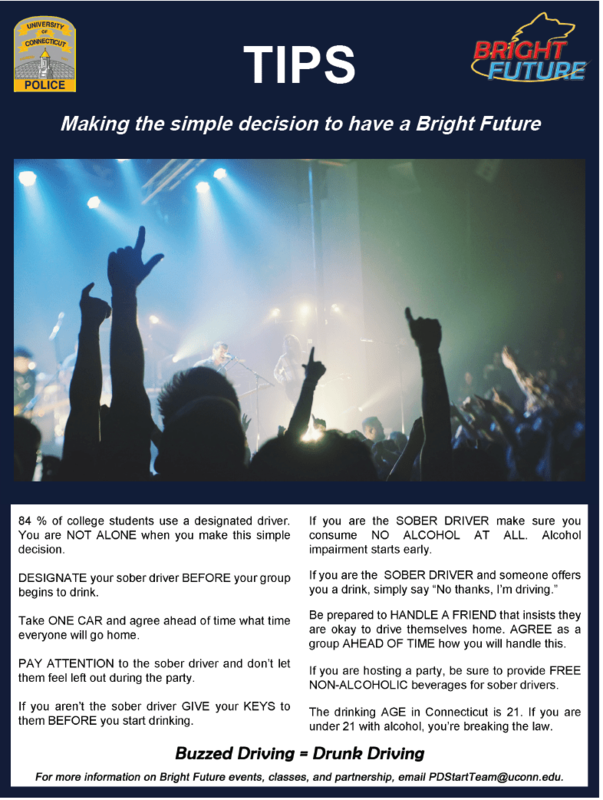 STORRS – The University of Connecticut police department is promoting Bright Future, an interactive program that develops awareness about misconceptions of campus drinking and drug use, Sergeant Jason Hyland said. Hyland said this is one of many programs of the UConn Police Community Outreach Unit’s public safety campaign to educate UConn students and Mansfield residents on pertinent issues. Bright Future, he said, does not tell students not to party; rather, it teaches preventative tips for alcohol or drugs. The program is activity-based, putting participants in simulations of different real-life alcohol and drug safety scenarios. “Danger in a red cup” is an activity where a student pours fake alcohol into a cup and guesses the alcohol content. A police officer then pours the “alcohol” into the number of shot glasses that reflect the actual amount of alcohol that the student poured. This shows students that the amount of liquid in a cup does not always accurately indicate how much alcohol they are actually drinking, Hyland said. Another station of the program is the DUI simulator: a three-lap race in the go-kart-style racing video game, Mario Kart. Each participant does one lap unimpaired and then must finish the last two while wearing “drunk goggles” and trying to answer simple questions. Participants have to say “crash” every time they crash during the race. Hyland said that scores dropped and crashes increased drastically after students put on the goggles, which simulate being drunk. “It’s about about getting the brain to multitask,” he said. He said the multitasking simulates the way in which alcohol disrupts mental processes while driving. Although the program engages students in various game-like activities, one purpose remains clear. During the last activity, an officer selects students to read a DUI story to a peer as if the peer were in the accident. Afterward, the real-life victim to whom the story belongs is revealed. The police evaluate the Bright Future program based on the surveys participants fill out at the start and finish. To insure they used the right approach for Bright Future, UConn Police received help last winter and spring from a student intern, Kathryn Overturf. A psychology major and criminal justice minor, Overturf did background research on universities known for successful practices in alcohol and drug awareness. Finding original ideas was sometimes a challenge, she said. She worked around it, but there was another factor that slightly limited her capability. Overturf is no stranger to the police department, as her father has been in environmental law enforcement for 30 years. Overturf once had aspirations of following her father’s footsteps, but then she changed her mind. Since graduating in May, she has followed that desire and works part-time with the UConn Police Support Services. Her role includes coordinating programs and making sure the police are following certain operational standards. Hyland said that having Overturf involved was a key part of the program’s creation. UConn Kappa Sigma executive committee member, Grant Cucchissi, witnessed Bright Future serving the 17 members of the fraternity’s fall pledge class. Cucchissi, a junior criminology major and a member of the U.S. Marine Corps Reserve, said the pledge class’s participation in Bright Future was very relevant. “Drug and alcohol abuse has hit very close to home for some members,” he said. Cucchissi said that the pledge members also benefited from a Q&A session with the police in the end. Hyland said the UConn Police Department knows its approach. 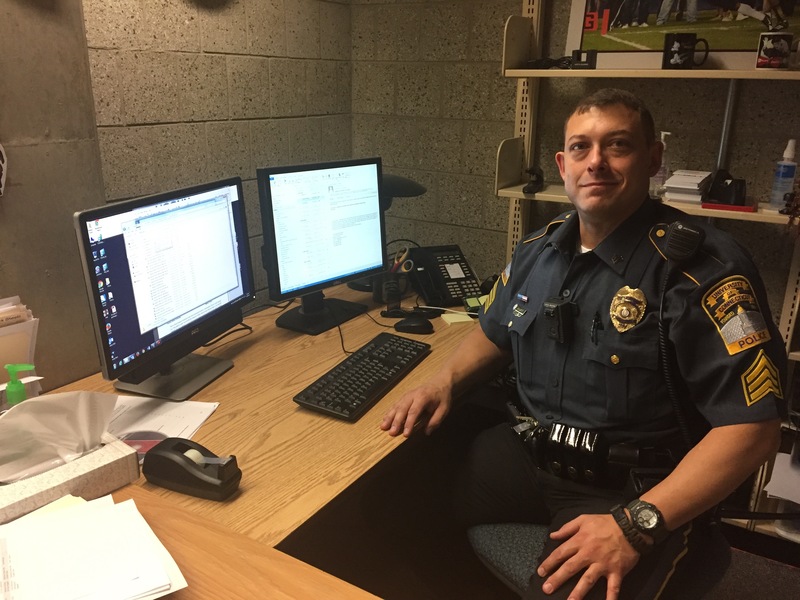 The UConn Police, he said, hope to make people understand that law enforcement is no longer solely responsible for safety; individuals must also contribute. He said the message is different for everyone, but the potential consequences of DUI do not change. “I don’t think anyone has a spare $5,000 floating around to flush down the toilet,” he said. To those at risk of DUI, Hyland suggested a simple solution.